The left side body and face shape represents your heart and stomach energy. The right side body and face shape represents your liver energy. If your right side eye brow, nose and right side of your mouth drop down it indicates an unhealthy liver. Well balanced Energy from left and right. Right side mouth falling down indicates liver problems. If both of your liver and heart have energy deficiencies both sides of your face and mouth will drop down. Find out more heart health diagnosis please click here read HOT eBook: How to read your health and happiness from your face? The window of the heart is Tongue. Heart energy governs the blood and the blood vessels. The heart is the house of the shen (spirit) and is manifested in the complexion and controls sweat. Heart energy is in a network with the small Intestinal. The tongue pull towards right side indicates heart problems. At TCM, the sweat is the liquid of the heart. If you sweat a lot without physical exercise this indicates a weakness of heart energy. When you are losing body liquid through sweat equally you are losing blood. If you have slimy hands or sweat a lot day and night, that will be an alarming sign for weak heart energy. By improving the heart energy the sweatiness could disappear. Liver function is free flow of Qi, controls the tendons , ligaments, nerves and hormones and filters and detoxs’ the blood and the manner is which they interact with the muscles. Movement and flexibility. The liver networks with the gallbladder. The eye is window of your liver. The healthy eye white should look like blue sky or lake, if the eye white color becomes muddy indicated liver hold toxins. This patient had condition of fatty liver; the eye white was muddy and yellow, the blood vessel has visible expansion. After treatment, the fatty liver condition has changed to normal. The eye white looks more clear. 2. The eyes become brighter with more sparkle. 3. The eye bags have disappeared. 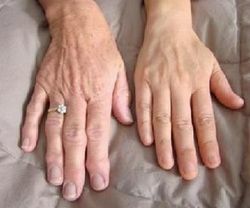 These two hands are from women of the same age(50 years old). The left one is a patient with arthritics and high blood pressure. You can see from the back of her hand the liver spots and deformed joints. At TCM the liver is in charge of detoxing the blood, and nourishing the joints. When the liver energy is deteriorating the blood will become toxic and the joints will become inflamed and deformed. Find out more liver health diagnosis please click here read HOT eBook: How to read your health and happiness from your face? The lip is window of your spleen and stomach. In Chinese medicine stomach energy is everything. To treat any health problem, it should start from the stomach. The whole body is a garden, the stomach energy is the garden soil. Other organs are plants in the garden. Without a healthy stomach no plant can grow. 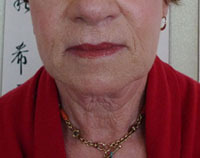 This patient has a very thin top lip, indicating long term digestion problems and a stiff neck. Saggy facial muscle indicates weak digestion. Find out more spleen health diagnosis please click here read HOT eBook: How to read your health and happiness from your face? The nose is the window to the lung. A blocked and running nose indicates phlegm and water retention. Phlegm is a product of water retention. To treat any nose or breathing related health problems, you need to treat the colon because the lung and colon are networked. A healthy stool shape is like a sausage and should be passed once a day. A shape is like cat pooh happens when you have constipation. Shapeless like porridge with undigested food indicates diarrhea Body is not able to process the food. In TCM Jing (extract) is the essence of kidney energy and dominates the strength of the bones, sexual energy, brain function and healthy sleep. kidney energy is manifest in the hair. It helps manufacture blood and marrow production and maintains vitality. It governs water release .The ear is the window of the kidney. At TCM hair is an extension of blood. The bone marrow produces blood, and kidney energy produces bone marrow. Hair loss indicates weakened kidney energy. The ear is the window of the kidney. Hearing loss indicates a kidney energy deficiency. Eye Bags indicating kidney weakness and bad sleep. Visits the toilet a few time a night. Low sexual energy, and problems with fertility and conception problems. Find out more kidney health diagnosis please click here read HOT eBook: How to read your health and happiness from your face? The Belly Button in Chinese medicine is a very important point, called: spirit tower gate. The heart and kidney energy cross from here. If your energy is strong and has good flow the belly button will stay in good shape, The healthy Belly Button shape should be round and deep. The healthy Belly Button shape should be round and deep. This patient's umbilicus is closed indicated low energy. This patient's umbilicus area full of wrinkles indicated badly digestion and she has had loose bowels for many years. This patient a 50 years old, female, has a "T" shape, belly button indicating gynecological problems. Find out more health diagnosis please click here read HOT eBook: How to read your health and happiness from your face? Overwhelming red cheeks show blood heavy with toxins indicating liver problems. The right hand is a patient with high-blood pressure and high-cholesterol. The hands' colour is dark red showing the blood is heavy, full of toxins and lacking in oxygen.